Password length distribution - shows the overall length of the passwords in a given wordlist. 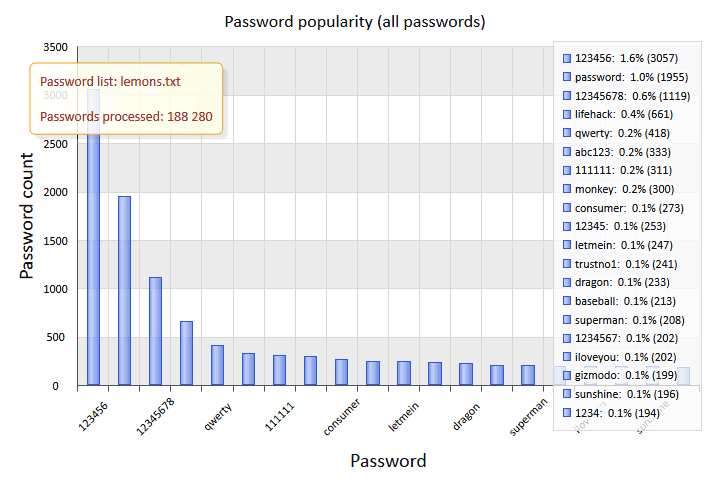 Password uniqueness - this report displays unique against identical passwords chart. Password popularity - top popular passwords and their percentage of the total number of passwords. Password format - statistics on the 20 most popular formats. The password format is defined by a character mask. For example, the DDUUUUDD mask means that the passwords consist of two leading and two trailing digits, with four capital letters in the middle. You can save popular password masks into a file so that you can easily use them in a mask-based recovery later. Character set exclusivity - this report shows the number of passwords consisting of one unique character set and the percentage of these passwords to those consisting of several ones. Character set diversity - the percentage ratio of passwords consisting of one, two, or more character sets. Character sets - lists all charsets the input passwords are made of. Character set ordering - the most popular password templates corresponding to the character set order. For example, the digit-string-special template includes the following passwords: 123password! @#, 1ove*****, and 12monkey^, etc. Character frequency - statistics on the frequency of characters. The 20 most frequent characters are displayed. Unique characters - the 20 least frequent characters. Frequently used leading characters - statistics on the most frequently used combinations of 1 to 3 characters in the beginning of words. Frequently used trailing characters - statistics on the most frequently used combinations of 1 to 5 characters in the end of words. Frequent combinations - the 20 most frequent combinations of 4 to 8 characters.